I'm one of those headstrong readers who will trudge her way to the end of a novel, no matter how awful, and no matter how difficult it is to persuade myself to even pick it up in the first place. It's been an incredibly long time since I've read something so utterly painful that I cannot find the strength, nor the patience, to make it to the end. 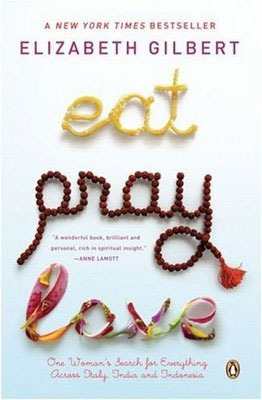 Enter, Eat, Pray, Love. Liz falls out of love with her husband after an epiphany on her bathroom floor where she finds God (you know, like, God). Fast forward a bit, and she's flouncing across the globe to the three I's; Italy, India, and Indonesia. We're caught up in a maelstrom of feminine angst, rich girl privilege, and our own three I's - irritation, insipidity, and ire. In the pages I read, Liz feels incomplete without a man, and this foray across the world is going to teach her how to love herself. As I didn't care whether or not she finally grew to find peace and contentment, I read a few reviews to check whether she is now able to live without male attention. As it happens, in the true spirit of things, the two hundred pages I wasn't stupid enough to read highlighted dully how she falls into the lap of another gent. This is how things go in Gilbert land, from what I can gather. As a woman who is on a voyage of self-discovery, the book is surprisingly male-orientated. Gilbert craves male attention, male affection, and male anything. She arrives in Italy wondering why old men aren't leering at her on the bus, because for God's sake, they should be. Although I would never trivialise the ending of a relationship as something to just get over, for most of us jumping on a plane and gadding around three spectacular countries just isn't an option. That Gilbert managed this with her unlimited funds, alongside a total lack of compassion and awareness for the foreign lives going on around her, and always embroiled in her own selfish inner turmoil (such as "why doesn't anyone fancy me? "), is utterly disgusting. She had an ulterior motive for every experience; if it wasn't find a man, it was learn the language so people are impressed with me and think I'm beautiful, or something along those vain lines. There are many out there raving about this book, but I have learnt lessons in the past about not listening to book-ravers. The simpering, the complete lack of awareness of privilege, and the utter incomprehension of what she was truly experiencing is sickening. Avoid with your entire soul, and you will find the enlightenment Gilbert (undoubtedly) has.